Our APP is formulated with a premium-grade asphalt to enhance weatherability. Combined with nonwoven polyester or glass fiber reinforcements, our APP systems exhibit tremendous strength and weatherability. APP is tough and economical like a thermoplastic, with the proven waterproofing of asphalt. Polyester-reinforced, APP mineral-surfaced cap or flashing sheet. APPeX 4.5M is used as a cap or flashing sheet in APP multi-ply roofing systems. Ceramic-Coated Roofing Granules: Specifically engineered for optimal embedment in the APP-blended sheet. The ceramic coating promotes excellent long-term adhesion. APP (Atactic Polypropylene) Polymer and Asphalt Blend: Provides an extremely durable sheet with excellent weathering characteristics, flexibility and dimensional stability for ease of handling and quick installations. Polyester Reinforcement Mat: Provides bidirectional glass-scrim reinforcement and offers robust tear strength and puncture resistance, allowing for high wind performance and excellent hail rating. The sheet also exhibits strong dimensional stability and enhanced elongation. Polyolefin Burn-Off Film: Promotes ease of heat welding. APPeX 4.5M CR G is used as a polyester-reinfored cool roof cap or flashing sheet in APP multi-ply roofing systems. Reflective Roofing Granules: Specifically engineered for high reflectivity, durability and optimal embedment in the APP modified bitumen sheet. Premium fire-retardant, polyester-reinforced, APP mineral-surfaced cap or flashing sheet. APPeX 4.5M FR is used as a cap or flashing sheet in APP multi-ply roofing systems. Premium APP (Atactic Polypropylene) Polymer, Asphalt and Fire-Retardant Blend: Provides an extremely durable sheet with excellent weathering characteristics, flexibility and dimensional stability for ease of handling and quick installations. APPeX 4.5M FR CR G is used as a polyester-reinfored cool roof cap or flashing sheet in APP multi-ply roofing systems. Premium polyester-reinforced, APP smooth-surfaced cap or ply sheet. APPeX 4S is used as a cap or base sheet in APP multi-ply roofing systems. Premium APP (Atactic Polypropylene) Polymer and Asphalt Blend: Provides an extremely durable sheet with excellent weathering characteristics, flexibility and dimensional stability for ease of handling and quick installations. Surfacing: Fine mineral parting agent on the top of the sheet. A polyolefin burn-off film on the bottom side enables the product to be applied using heat-welding techniques. BICOR M FR is used as a premium cap or flashing sheet in APP multi-ply roofing systems. Ceramic-coated Roofing Granules: Specifically engineered for optimal embedment in the APP-blended sheet. The ceramic coating promotes excellent long-term adhesion. Granules are available in white, black and tan (Black and tan may require extended lead times). Fiber Glass/Polyester Reinforcement Mat: Combines the excellent tensile strength, toughness and puncture resistance of a polyester mat with the dimensional stability and lay-flat characteristics of fiber glass. Surfacing: Fine mineral parting agent on the bottom side. Enables the product to be applied in cold adhesive or heat welding techniques. BICOR S is used as a premium base or ply sheet in APP multi-ply roofing systems. Surfacing: Fine mineral parting agent on both sides of the sheet. Enables the product to be applied in cold adhesive or heat welding techniques. Superior polyester-reinforced APP smooth and slate-surfaced membranes. DIBITEN Poly/4.5 CR G is used as a polyester-reinfored cool roof cap or flashing sheet in APP multi-ply roofing systems. Reflective Roofing Granules: Specifically engineered for high reflectivity, durability and optimal embedment in the APP modified bitumen sheet. Each pallet of Dibiten Poly/4.5 CR G contains three bags of CR G granules to dress up bleed out. Fiber glass-reinforced APP base or ply sheet. JM APP Base is used as a base or ply sheet in APP multi-ply roofing systems. Fiber Glass Reinforcement Mat: Offers excellent dimensional stability and tensile strength and withstands differential movement. Because it has no thermal memory less time is needed to relax the sheet, allowing for ease of installation. The fiber glass mat also has good lay-flat characteristics. Surfacing: Fine mineral parting agent on both sides of the sheet. Enables the product to be applied using cold adhesive or heat welding techniques. 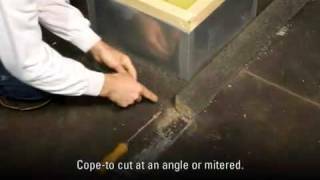 JM APP Base 2.0 SQ is used as a base or ply sheet in APP multi-ply roofing systems. Surfacing: Fine mineral parting agent on the top side of the sheet. A polyolefin burn-off film on the bottom side enables the product to be applied using heat welding techniques. JM APP Base Plus is used as a base or ply sheet in APP multi-ply roofing systems. Polyethylene-reinforced, self-adhering SBS vapor barrier. Tri-laminate woven polyethylene, nonslip, UV-protected top surface: Provides temporary weather protection for 90 days. Provides high tensile strength and puncture resistance. Self-sealing, high-quality SBS rubber and asphalt blend: Provides low air and vapor permeability. Silicone release film: Allows for ease of self-adhering installation. Fire-retardant, fiber glass/polyester-reinforced, APP mineral-surfaced cool roof cap or flashing sheet. TRICOR M FR is used as a premium cap or flashing sheet in APP multi-ply roofing systems. Premium APP Polymer and Asphalt Blend: Provides an extremely durable sheet with excellent weathering characteristics, flexibility and dimensional stability for ease of handling and quick installations. The FR blend contains additional fire-retardant additives. Surfacing: Fine mineral parting agent on the bottom side. Enables the product to be applied using cold adhesive or heat-welding techniques. Colors: Granules are available in white, black and tan. Black and tan may require extended lead times. Fire-retardant, fiber glass/polyester-reinforced, APP, acrylic-coated, mineral-surfaced cool roof cap or flashing sheet. TRICOR M FR CR is used as a premium cap or flashing sheet in APP multi-ply roofing systems. Ceramic-Coated Roofing Granules With Factory-Applied Cool Roof Coating: The cool roof technology combines the proven UV protection of ceramic-coated granules with a highly reflective coating, offering long-term performance and potential energy savings. Premium APP Polymer and Asphalt Blend: Provides an extremely durable sheet with excellent weathering characteristics, flexibility and dimensional stability for ease of handling and quick installations. The FR blend contains additional fire retardant additives. Surfacing: Fine mineral parting agent on the bottom side. Enables the product to be applied using cold adhesive or heat welding. TRICOR M FR CR G is used as a premium fiber glass/polyester-reinforced cool roof cap or flashing sheet in APP multi-ply roofing systems. Surfacing: Fine mineral parting agent on the bottom side. Enables the product to be applied using cold adhesive or heat welding techniques. Premium polyester-reinforced APP smooth-surfaced cap or base sheet. TRICOR S is used as a premium base or ply sheet in APP multi-ply roofing systems. Premium APP Polymer and Asphalt Blend: Provides an extremely durable sheet with excellent weathering characteristics, flexibility and dimensional stability for ease of handling and quick installations. ValuWeld G incorporates the features of a non-woven polyester mat with the benefits of an APP modified asphalt. ValuWeld G is used as a cap or flashing sheet in APP multi-ply roofing systems. Polyester Reinforcement Mat: Offers good tensile strength, toughness and puncture resistance and can accommodate stresses created by typical rooftop expansion and contraction forces. Colors: White and Black only. ValuWeld S incorporates the features of a non-woven polyester mat with the benefits of an APP modified asphalt. ValuWeld S is used as a cap or base sheet in APP multi-ply roofing systems. Fiber glass-reinforced, asphalt-coated venting base sheet. Ventsulation Felt may be used as a base sheet for any built up roofing or modified bitumen roofing system to be installed over a substrate that potentially contains moisture. 1" Embossed Waffle Pattern Grid Channels: Promotes moisture vapor venting. Helps prevent blistering of asphalt-based roofs when installed over potential moisture-containing substrates such as: Re-covers over existing roof membranes, lightweight insulating fill or gypsum decks. Fiber Glass Reinforcement Mat: Low moisture, excellent dimensional stability and resistance to rot make it an ideal replacement for organic base sheets. Provides a solid dimensionally stable substrate for other roofing membrane components. Surfacing: Coarse minerals on one side. Reflective Roofing Granules: Bright white granules specifically designed for high reflectivity and durability. Ceramic-Coated Roofing Granules: Specifically engineered for optimal embedment in the bitumen. These granules are colored with durable pigments, bonded in a ceramic matrix and treated to promote excellent long-term adhesion. One-part, specification grade, penetrating priming solution for multiple substrates prior to the application of a bituminous roofing system. Use: Used to prepare substrates prior to the application of hot asphalt or cold adhesives in BUR, SBS and APP modified bitumen roofing systems. Do not use Asphalt Primer as a finish coat on roofs. Type: One-part, specification grade, penetrating priming solution. Substrates: Compatible with concrete; gypsum; masonry; block; brick; and metal surfaces. Color: Black Features: Low VOC and sprayable. One-part, asphalt-based, trowel-grade mastic for use in flashing details for bituminous roofing systems. Use: To adhere both vertical and horizontal roof flashing surfaces. Useful for repairing leaks in metal, shingles, concrete, flashings, gutters, around chimneys, flues, soil pipes, drains, eaves, cornices and roof perimeters. Type: One-part, low VOC, asphalt-based trowel-grade mastic. Features: Maintains bond during varying temperatures and weather conditions, and bonds to dissimilar materials. Excellent Durability. Remains Flexible Over Time. Polyurethane adhesive for attaching insulation/cover boards to the roof deck or other insulation boards. Use: JM One-Step Foamable Adhesive is a two-component polyurethane adhesive used for attaching insulation or cover boards to the roof deck or to other insulation boards. Type: Two-part, cold application insulation adhesive. (Lightweight structural, poured-in-place structural, precast, and insulating); treated plywood (5/8" [1.58 cm] min. thickness); cementitious wood fiber plank; base sheets; gypsum; and some existing smooth-surfaced asphalt (per inspection). 1. Ensure that all insulation boards are 4' x 4' or smaller. Features: Solvent free. Set boards immediately into adhesive; reduces installation time and maximizes adhesive footprint. No hoses or pumps required. Always on ratio, eliminates guesswork. Substrates: Compatible with the following insulations, cover boards, and substrates1 : polyisocyanurate; HD wood fiber; perlite; Invinsa® Roof Board; gypsum; concrete2 (Lightweight structural, poured-in-place structural, precast, and insulating); treated plywood (5/8" [1.58 cm] min. thickness); cementitious wood fiber; gypsum; smooth or granulated BUR, APP or SBS. 2. Ensure that the concrete is adequately dry for adhesion. Features: Solvent free, and HCFC or CFC free. Universal adhesive for adhering fleece-backed membranes and insulation boards. Sets in minutes. Elastomeric cold-application adhesive for installing SBS and APP modified bitumen membranes. Meets the requirements of ASTM D 3019, Type III, Grade 2. Use: For adhering roofing plies, modified bitumen membranes and for aggregate surfacings. It can be used as a direct substitute for asphalt in all JM modified bitumen roof membrane specifications. Type: One-part, elastomeric cold application membrane adhesive. Features: Cures to form a durable, elastomeric and watertight film. Cold process – does not have to be heated. Ready for use as shipped. Liquid-applied flashing material for bituminous systems and the PermaFlash™ Bituminous Flashing System. Use: For use with JM BUR and SBS membrane products. It is part of the JM PermaFlash® Bituminous Flashing System for penetrations and other details. Ideal for areas where hot asphalt is prohibited, not desirable or not practical. Type: Two-part, elastomeric, liquid-applied flashing material. Features: Cures to a durable, elastomeric film and forms exceptional bonds between the modified bitumen and underlying substrate. Resists virtually all factors affecting base flashing performance while providing superior flexibility and durability. UV stable, high solids, low odor, VOC compliant. Use: As a substitute for asphalt and MBR® Flashing Cement in JM modified bitumen flashing details, and can be used to adhere the JM modified bitumen flashing systems and built-up roofing felts to vertical surfaces, as a general purpose mastic on most built up roofing and modified bitumen flashing details, or to strip in the laps of modified bitumen base flashings. Type: One-part, asphalt-based, trowel-grade mastic. Features: Cold process – does not have to be heated. Cures to form a durable, elastomeric and watertight film. Ready for use as shipped. Liquid-applied system that can accommodate the most challenging penetration shapes. The PermaFlash System consists of PermaFlash Primer, MBR Flashing Cement, and PermaFlash Scrim. It is an integrated flashing system specifically formulated for use in bituminous systems. Features: Can be used to flash most penetrations, drains, and vertical surfaces. Resists virtually all factors affecting flashing performance while providing superior flexibility and durability. High solids, low odor, VOC compliant, and UV stable. PermaFlash Primer (Low VOC): One-Part Solvent-Based Primer that improves adhesion of MBR® Flashing Cement to nonporous substrates. PermaFlash Scrim: Flexible stitchbonded polyester scrim. #14 case-hardened steel insulation and membrane fastener with a #3 Phillips head. All Purpose Fasteners are #14 case-hardened steel fasteners with a #3 Phillips head. The point is designed for quick installation in new or re-roof applications. Deck Types: Wood, Concrete, and 18 - 24 gauge (1.25 mm - 0.56 mm) Metal. * See corresponding data sheets for information regarding UltraFast, High Load, and APB Plates. Expanding base sheet fasteners with GALVALUME®-coated steel plates. LWC Pre-Assembled Base Sheet Fasteners are twin-legged, expanding base sheet fasteners with 2.7" (6.9 cm) Galvalume®*- coated steel plates. Deck Type: Lightweight insulating concrete roof decks, with minimum thickness of 1.25" (3.18 cm), and 1.25" (3.18 cm) for gypsum decks. * Galvalume is a registered trademark of BIEC International, Inc. and some of its licensed producers. Lite-Deck Fasteners are available in lengths from 2 5/8” to 12" (67 mm to 305 mm), come with a square drive and offer coarse thread to provide high pullout resistance. Lite-Deck plates are 3" (76 mm) round, Galvalume®*-coated plates for use with Lite-Deck Fasteners. Solid glass-reinforced nylon membrane and insulation fasteners. Polymer Auger Fasteners are glass-reinforced nylon fasteners with an internal ¼" (6 mm) square drive. Polymer Auger Fasteners have a 1" (2.5 cm) diameter head. Polymer Auger Fasteners are available with Galvalume®*-coated, metal stress plates, designed to lock into the fastener head. Diamond point, nonthreaded carbon steel insulation and membrane fastener. Structural Concrete Deck Fasteners are diamond point, non-threaded fasteners for hammer-in installation of insulation and single ply membranes to structural concrete. These carbon steel fasteners have a corrosion-resistant coating. * See corresponding data sheets for information regarding UltraFast, APB and High Load Plates. The UltraFast AccuTrac Fastener and Plate System utilizes the standard UltraFast Fastener and the UltraFast Accutrac, recessed or flat bottomed, square plate. The AccuTrac tool positions the plate and installs fasteners 15⁄8" - 6" (4.13 cm - 15.24 cm) in a one-step process. Consistent vertical alignment of fasteners ensures maximum thread engagement and pullout performance. Deck Type: Wood or 18 - 24 gauge (1.25 mm - 0.51 mm) Metal. *Galvalume is a registered trademark of BIEC International, Inc. and some of its licensed producers. **Standard UltraFast Plates are not compatible with this system. #12, case-hardened steel, polymer-coated fastener with GALVALUME®-Metal or Locking Plastic Plates. Phillips head or a ¼" (6.35 mm) hex head. The drill point is designed for quick installation in new or re-roof applications, and provides exceptional drilling capability in higher tensile decks. UltraFast Locking Plastic Plates are 3” (7.62 cm) round, high strength polypropylene plates with a special locking feature. UltraFast Metal Plates are 3” (7.62 mm) round or square, premium Galvalume®*-coated steel metal plates. Polymer-coated fastener with GALVALUME®-Metal or Locking Plastic Plates. The UltraFast Pre-Assembled Fastener is a #12, case-hardened steel, polymer-coated fastener with a buttress thread design that provides maximum pullout values and minimizes fastener backout.. Available with a #3 Phillips head or ¼" (6.35 mm) hex head (available by special order only). The drill point is designed for quick installation in new or re-roof applications, and provides exceptional drilling capability in higher tensile decks. The UltraFast Locking Plastic Plate prevents fastener pop-up. Deck Types: Wood or 18 - 24 gauge (1.25 mm - 0.56 mm) Metal. Galvanized-steel tube and GALVALUME®-coated steel disc clamped to a wire-locking staple. UltraLok Locking Impact Fasteners and Plates consist of a preassembled Galvanized steel tube, a 2.7" (6.86 cm) Galvalume®*-coated steel disc, and a precision-formed, coated- steel, high tensile, wirelocking staple. The disc is securely clamped to the tube and is rib-reinforced to resist cupping.